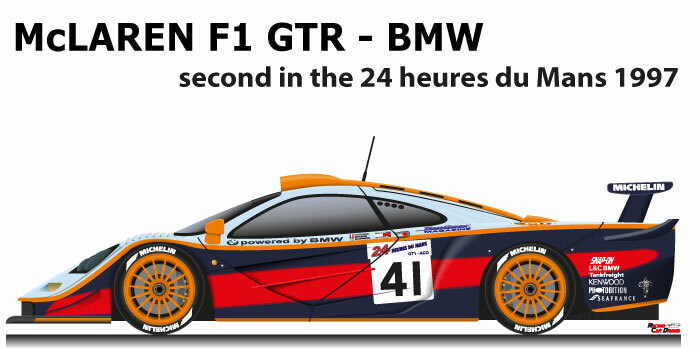 The McLaren F1 GTR – BMW n.41 is a car that participated in the Le Mans 24 Hours of 1997. After the success with the McLaren F1 GTR n.59 in 1995, the Woking team tried to face the rise of the new GT1 presented by Porsche, Nissan and Panoz. Modified the car by extending the nose and rear increasing the downforce, and lowering the engine displacement. Jean-Marc Gounon, Pierre-Henri Raphanel and Anders Olafsson with the McLaren F1 GTR – BMW n.41 came second at the 24 Hours of Le Mans in 1997. The Gulf Team Davidoff car even starting in twenty-fifth position thanks to a constant comeback cut the finish line in second position with a gap of one lap from the winner TWR Porsche WSC n.7 of Michele Alboreto, Stefan Johansson and Tom Kristensen. With the McLaren F1 GTR, the Gulf Team Davidoff finished third in the 1997 FIA GT championship.